Hi Guys, First off I’ll introduce myself. I'm Olly, I am the AutoGlanz "apprentice" and I own our Mk2f Breadvan project. I'm also Joe's (The Boss) younger brother. I've been lurking on here for a while now and decided it would be a good idea for us to become a sponsor. Anyway, onto the Breadvan. I bought the Breadvan back in April with the intentions of having it as my first car without doing anything to it. However, that soon changed because it wasn't a very good image for the business, and I can’t help myself. It's a 1993 1.0l Breadvan that had seen better days. The previous owner, who we know pretty well, decided it would be a good idea to attach a homemade bike rack to the roof using a drill and 8 10mm bolts. The bottom of both wings were rotten and the passenger side had taken a nice hit to the front corner of the wing. Other than that it was pretty solid and has only 57,000 on it. It did need a good clean though, but that's not a problem when you work for a car cleaning chemical company. So, at the start of May i had this great idea that we should give the car a full respray before Waxstock on the 24th July and put it on a club stand for everybody to see. Let’s just say that the idea didn't go down well with Joe to start with, but he came round and agreed to be a part of the challenge. So i started off by buying 2 new wings and removing the old ones. I then thoroughly clean the inner arches and removed all of the wax oil so that it was ready for some paint. The first real progress was made when we painted the engine bay. With the limited time available we decided against taking the engine out so we will do this when we return from Waxstock. After this I bought wheels and lowering springs and shocks. The wheels were in a bad way so they have been refurbished now. The suspension was coated in our development ceramic and were left to cure. Next up i stripped, cleaned and prepped the interior ready for Joe to apply the paint. At the same time we painted under the rear bumper and inside of the wheel wells and the insides of the wings. Next up, getting the exterior ready for paint. We started off by deleting the rear wiper. We also removed the rear arch splats and welded up the holes. While the welder was out we welded up the 8 holes from the previous owners bike rack. We then shaped the whole of the exterior of the vehicle ready for it to have a couple of coats of high build primer. Next up we fitted the suspension and gave all suspension parts a lick of paint. Here's after it was fitted. That's us pretty much up to date apart from the weekend just gone. The polo is now painted, with only just under 2 weeks until Waxstock. Thanks for reading, I'll update this when we get some more done. Hi all, first official thread on here. So this is my 1.6cl 6n polo project, I've yet to decide whether to rat or restore. the story so far, so I purchased this car off an old customer with a little over 61k on the clock. It had/ has a number of mechanical faults that I've already made progress on attacking some of these. cambelt & water pump (done) Head-gasket (done) thermostat (done) blocked radiator (flushed system) clutch (needed soon) faulty ignition coil (replaced) i still have a few other minor repairs and maintenance to do such as all fluids to be changed, filters, plugs etc. Once ive taken care of making sure the car runs as well as it can do I will move on to any modifications such as coilovers, wheels etc. As you'll see in the pictures all arches are badly corroded but not un-repairable. And this is why I'm undecided between rat or restore lol. Anyway heres some pics that have got so far feel free to put forward any suggestions etc as I'm always looking for fresh ideas lol. Having some difficulty uploading pics so will try to resize them and try again tomorrow. 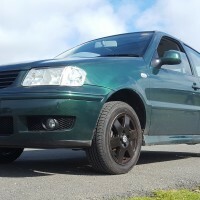 Here's my polo who has some ideas on what to do to it?? Hey guys, can someone give me the name/code of, or like me to the bulb that illuminates the heater controls on the centre console? mines blown and i can't seem to find it as i don't know what I&#39;m looking for. Thanks in advance!